The Industrial Designers Society of America (IDSA) hosted the 37th annual International Design Excellence Awards (IDSA IDEA®) 2017 Ceremony and Gala on Aug. 19 in Atlanta, GA—revealing which 25 designs won Gold and which 52 designs won Silver in one of the world’s most prestigious and rigorous design competitions. See all the winners. Foster led more than two dozen global design experts in judging categories covering products, experiences, strategies and more—including two new categories this year: consumer technology and branding. Onsite jurying was held in May at the newly-renamed Henry Ford Museum of American Innovation in Dearborn, MI. Bronze winners were announced on June 29, while Gold and Silver winners were announced by Foster—and The Henry Ford's Chief Curator and IDEA 2017 Juror Marc Greuther—at the ceremony on Aug. 19. Best in Show Award: Microsoft HoloLens by Microsoft Device Design is touted as the first, self-contained, untethered holographic computer that embeds content and applications into physical surroundings to see, place and interact as if holograms are part of the physical world. This mixed reality is enabling new ways to create, communicate, work and play. Curator’s Choice Award, chosen by Greuther: Dream Ring Concept by havas X IDEAfree is an inexpensive, eco-friendly, feminine hygiene product initially designed for use in developing countries where girls may give up going to school because they don't have access to affordable and sanitary menstruation pads. Chair’s Award, chosen by Foster: Sai Flatpack Furniture, by Mathew Simon of ArtCenter College of Design and Ayuri Tsunoda of Tama Art University, is an infinitely expandable collection of sustainable furniture—handmade of bungee cords and plywood frames to create value for artisans. Plastics Innovation Award, chosen by sponsor Plastics Industry Association: Makeblock Neurons by IU+ Design and Makeblock Co., Ltd. is a programmable, electronic building-block platform for STEM education and practice. With an intuitive app, Makeblock Neurons enable users of all programming levels to build gadgets with ease. People’s Choice Award, voted online by the public: MATCHER - Shopping eXperience Innovation by Matcher Service for Samsung SDS is an automatic shopping recommendation service that matches an item to a customer's needs through optimization algorithms known as prescriptive analytics. Makeblock Neurons – IU+ Design and Makeblock Co., Ltd.
SENSORO Alpha Base Station – Sensoro Co., Ltd.
Mi MIX – Xiaomi Communications Co., Ltd.
Poputar P1 – Shenzhen Culture Technology Co., Ltd.
Q9 QLED TV – Samsung Electronics Co., Ltd.
FlexWash™ + FlexDry™ – Samsung Electronics Co., Ltd. The ceremony was followed by the IDEA 2017 Gala, sponsored by Samsung, at the High Museum of Art. IDSA IDEA 2017 winners will be featured in fall IDSA INNOVATION magazine’s Yearbook of Design Excellence. 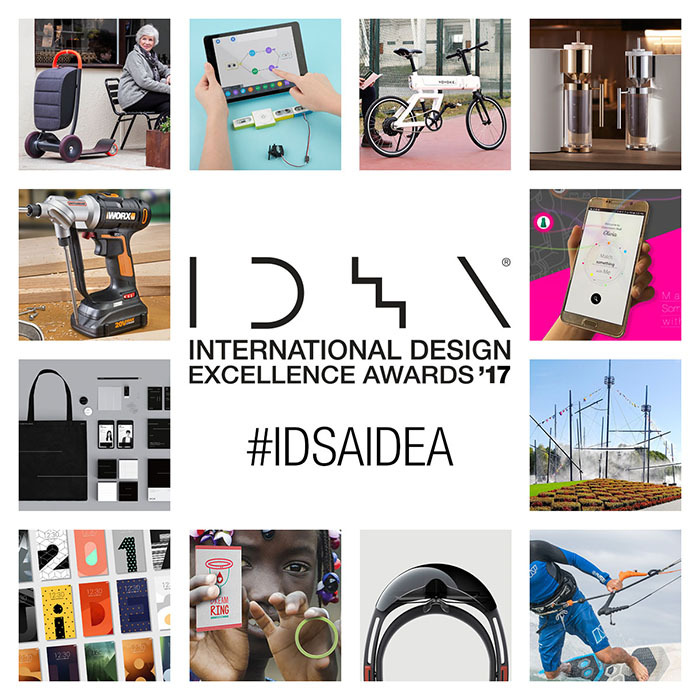 Congratulate the winners using #IDSAIDEA @IDSA on Twitter; Industrial Designers Society of America on Facebook and LinkedIn; and @IDSAdesign on Instagram.